Toward the middle of Society Café Encore lies a wonderful middle room where moose heads with very large antlers are mounted on the dark green walls. They are intended to enhance the whimsical feel and fun of the restaurant, and are a very “Oscar Wilde” concept, as in Victorian England game heads were quite frequently mounted on the walls. Potted palms sit beside both antlers with lamps next to them. 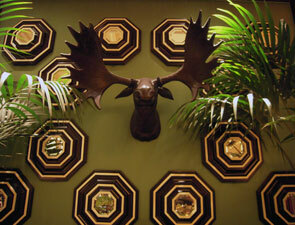 The moose is framed by fanciful decorative mirrors that are strategically placed around it. A very comfortable black semicircular banquette creates a sort of nook below the moose head that is the perfect spot for a meal within the restaurant, with just a wee bit more privacy. Delicate interesting touches are strategically placed throughout the restaurant, from the entryway to each portion of the multilevel dining room. As you enter you’ll notice two limestone planters. Although these were originally meant to contain live plants, Chef Canteenwalla apparently thought they lacked something. They just weren’t special enough, so Roger Thomas, EVP of Wynn Design & Development, took it from there and had metallic floral sculptures designed by metal worker Vic Chiodini of Intustrial. They feature simple parts from decorative arts and are mounted in reproduction urns of the 18th century Louis the XVI style that have been carved in limestone. 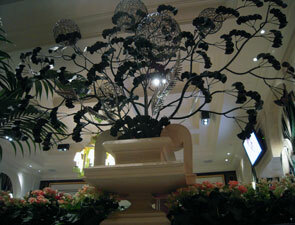 These intricate yet airy sculptures feature tall branches with elaborate balls and small clusters of unusual leafy branches. Additionally, after you enter the restaurant and move away from the front dining room, toward the left you’ll see a fanciful sculpture of Pan, or perhaps a fellow satyr, twisting away atop a planter and in front of a fanciful sun. This white plaster sculpture was found in Paris and brought to Encore. The little touches like this really make Society Café a more special and fun place.